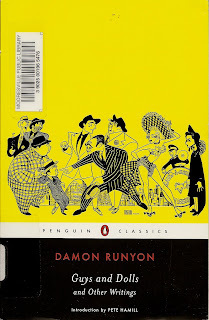 Every now and again I return to the stories of O. Henry, Edgar Allan Poe and the wry, witty writings of Damon Runyon. This neat little paperback was re-issued about 3 years ago with an introduction by Pete Hamill. It contains the complete manuscript of "Guys and Dolls", and then, as promised in the title, a few more stories are thrown in to round things out. New York City in the 1930's through the late 1950's was a colorful place with equally colorful people. And many of them hung out on Broadway. Long before the re-vitilization of Times Square took place, it was a place to go and see all kinds of various hustlers, tricksters, 3 Card Monte sharks, street salesmen with suitcases that had accordion legs for quick getaways, and all sorts of hookers, shysters and gamblers. I was first introduced to the Times Square area at about age 5 when my Uncle Irving took me with him to get tickets for a show. My mother was horrified. There were peep shows in antiquated machines that worked with the turning of a handle that caused still picture cards to flip rapidly, making a moving picture. They cost 5 cents. You didn't see much, but those machines were, for me at least, a tangible link to an era which was quickly passing. The antics of characters such as Sky Masterson, Jew Louie, Sam the Gonoph, Liverlips, Benny South Street and all of their minions are not just some abstract creation of the author. They are the real thing. These "Guys", and "Dolls", are the people like my Grandfather Pincus, who made it out of the Lower East Side and spent alot of time and money gambling on the ponies. They spoke from the corners of their mouths as they went about their business, collecting bets and exchanging tips. They effected a thin veneer of class with their mispronounced mangling of words that they had only seen in writing, but had never heard spoken. They were saavy in the ways of the street, in much the same way as they were lost in the world of art and literature. But they weren't dumb. 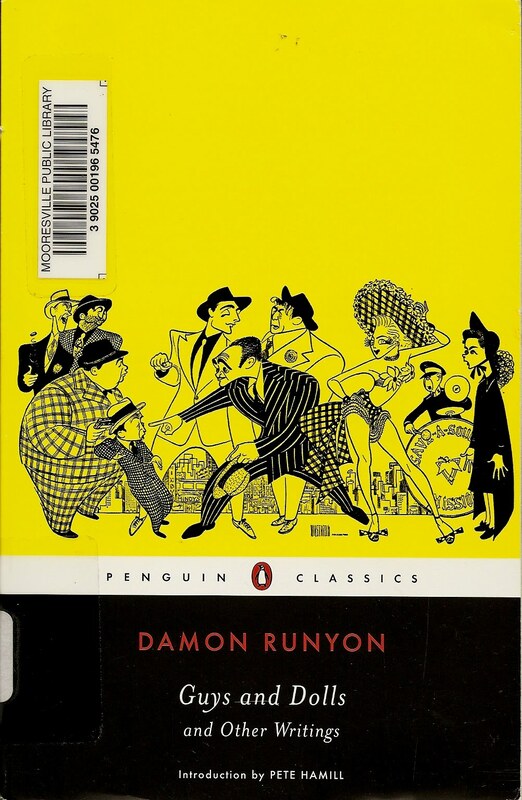 The importance of the characters created, or chronicled, by Damon Runyon can be boiled down to the fact their story is the story of New York City during those decades. Mr. Runyon paved the way for the likes of Jimmy Breslin, Norman Mailer and Pete Hamill. His was the template that became the "norm" for a whole new generation of writer's who would go on to chronicle New York City during the 1950's and 1960's. Even the McCourt brothers, with their extensive writings, are an extension of this style of story telling. New York City will always be in the midst of change. Her sounds and smells will always be in a flux. But the individual stories of people trying to make it, trying to scheme, scam and sell a dream will always remain the same. That's what I love so much about Damon Runyon. He captured it all so well, so many years ago.